With Precious Lace, the Maison sets the stage for a twirling, virtuoso Haute Joaillerie collection. Radiating the graceful charm of blooming petals and the joyful flurry of a whirling tutu, the Precious Lace collection is a dream ballet of dazzling colors for which Chopard has created the jewelry as a great couturier would design the costumes. Delicate and precious, finely wrought and set with luminous gems, the Precious Lace collection is a lacework of intermingled creativity and emotion. Jewelry watches along with matching necklaces, earrings and rings compose the Precious Lace collection, which is as refined as it is spectacular. Just as Haute Couture utilizes only exceptional fabrics, giving life to this collection naturally called for the most beautiful stones. 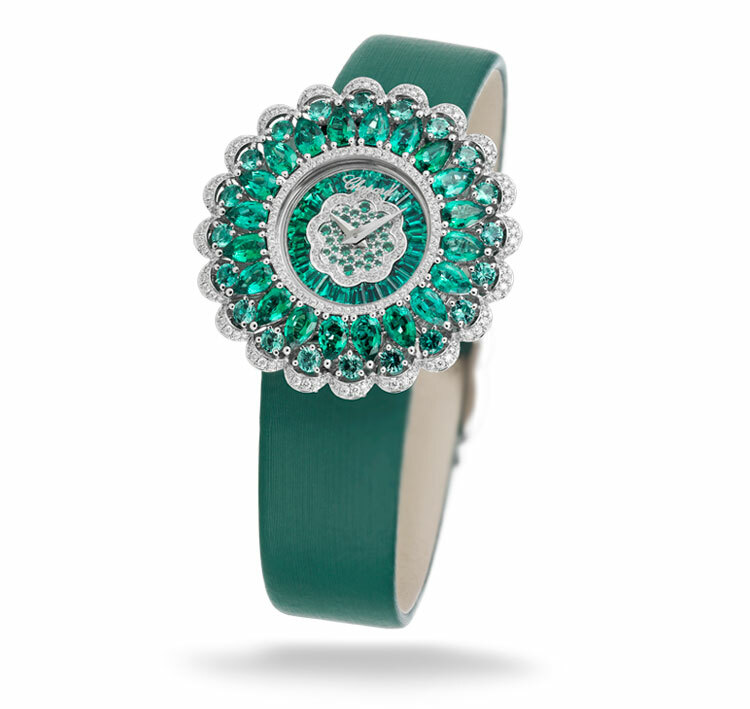 The watches are set with pear-shaped and brilliant-cut diamonds, sapphires, emeralds and rubies. On their dials, matching baguette-cut gems surround a dainty corolla evoking a floral motif using the snow-setting technique. The models are fitted with bracelets extending this jewelry lacework theme, or with brightly-colored, brushed fabric straps. The earrings and rings reflect the subtle curves of the watch, while the necklaces are graced with delicate, interlacing openwork motifs. The Precious Lace collection supremely embodies technical virtuosity dedicated to resolutely modern artistry, testifying to the broad stylistic repertoire of the Geneva-based House. Chopard creations belong to the finest Haute Joaillerie tradition and showcase the artistic skills of top craftsman: wax-sculpting experts, jewelers, stone-cutters, gem-setters and polishers. From lines to volumes, from goldsmithing to fashioning precious stones, they push the boundaries of feasibility and combine their talents in breathing life into the most beautiful jewelry. While these creations involve classic expertise and faithfully safeguarded traditions, they are also nurtured by exceptional inspiration and boldness, vividly demonstrating the major role played by Chopard on the contemporary Haute Joaillerie scene. Collections such as Animal World and Fleur d’Opales reveal an impressive creative vitality as well as the unbridled imagination of the company’s co-president and artistic director, Caroline Scheufele – the driving force behind the development of the Chopard Haute Joaillerie collections. 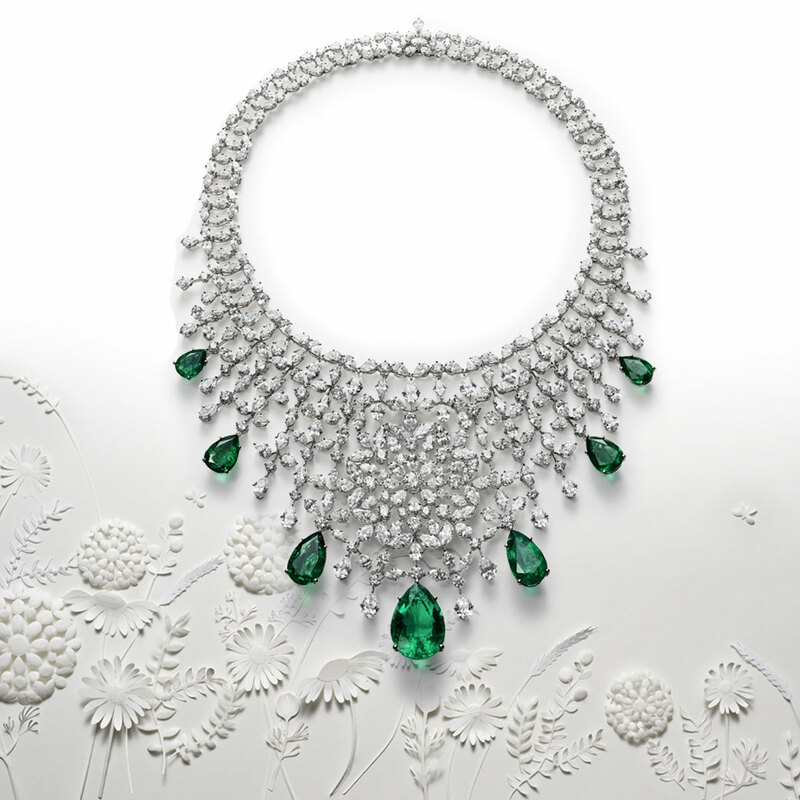 On the occasion of the Paris Couture Week, Chopard presents its latest creations from the Precious Lace collection. 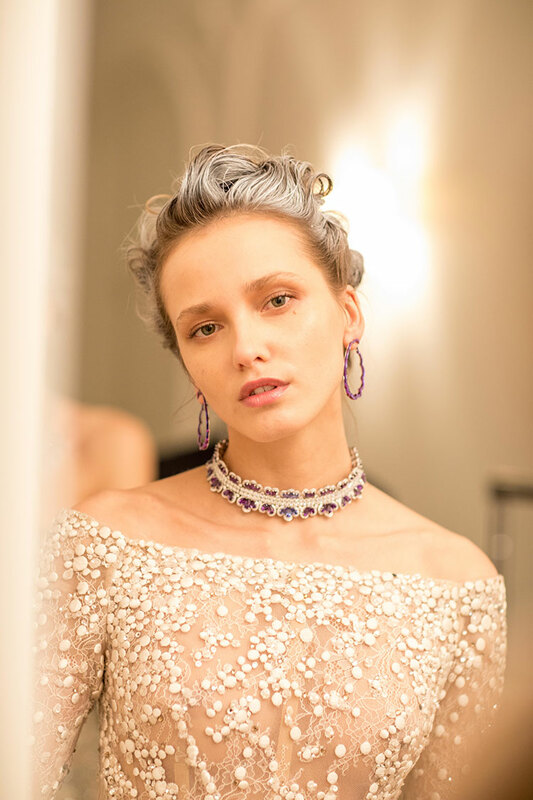 Designed as an exquisite gold and gemstone lacework, this collection was imagined by Caroline Scheufele as a perfect alliance between Haute Couture and High Jewelry. Timeless design enables Chopard to set its unique seal on a line epitomizing its expertise and mastery of the jewelry-making art. A sparkling diamond lacework reveals the sensuality of the skin it adorns. Dazzling precious colored stones twinkle in the light of the crystalline chandeliers of a ballroom, on an evening full of promise. The stellar radiance of a High Jewelry set, in all its resplendent majesty. From the magic of festive evenings and whirling gowns, Chopard has drawn both the inspiration and the supremely graceful elegance of its signature High Jewelry. Peerless allure, an unparalleled sense of light and motion. Precious Lace symbolizes the quintessence of classic jewelry expertise and faithfully preserved traditions, nurtured by a new vision and exceptional creative boldness. These creations invite us to explore a fascinating universe of contemporary jewelry, illuminated by the energy and the visionary talent of Caroline Scheufele. Precious Lace sets the stage for precious intertwining patterns where the radiance and power of precious stones reveal their esthetic marvels. The result is a true ‘goldsmith’s wardrobe’, in which the delicacy of openwork fabric echoes the immaterial lightness of the gem-setting as well as the architectural lines of this collection, weaving subtle ties between the world of Haute Couture and that of High Jewelry. These lines, harmonious and light, classical yet sophisticated, have become the unmistakable signature of the Maison, embodying both its jewelry expertise and its creative genius. Among the creations composing this varied repertoire is a majestic diamond and tanzanite ensemble made up of a necklace, ring and matching earrings. Another necklace unfurls its diamond lacework across a delicate cleavage, enhanced by the radiance of seven pear-shaped diamonds. The gaze also marvels at a remarkable diamond and ruby set comprising a pair of chandelier earrings and a choker whose lace-like diamond structure is dotted with heart-shaped rubies adorning this playful, precious and flamboyant creation. 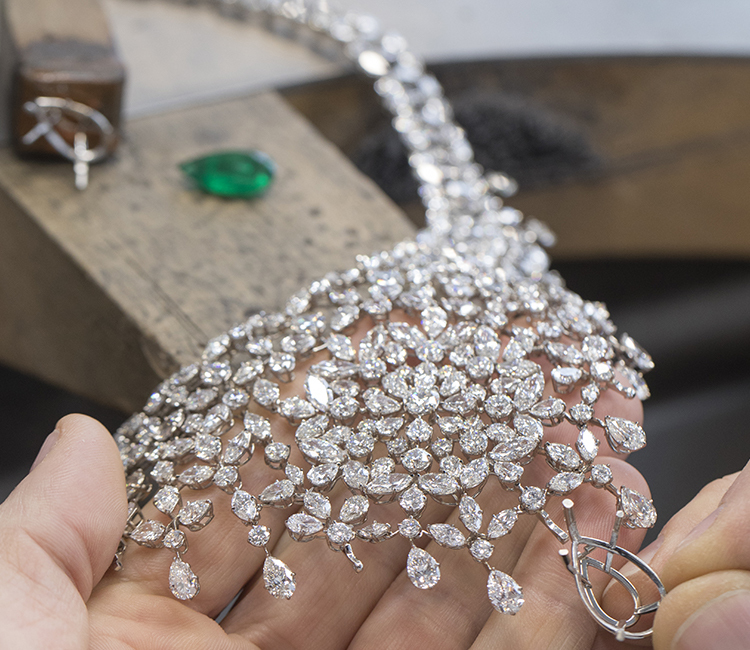 The most spectacular High Jewelry pieces are conceived in the heart of Chopard’s Geneva workshops. Thanks to its creative vision, the Maison has steadily developed the High Jewelry sector that is firmly rooted in the jewelry-making tradition of the Scheufele family. From designs through to production, artisans combine their skills to give shape to authentic works of art, where traditional craftsmanship meets cutting-edge technologies. These exceptional creations call upon the entire range of High Jewelry professions: designers, wax sculptor-jewelers, jewelers, gem-cutters, gem-setters, polishers… Transforming line into volume, from gold crafting to gemstone workmanship, they give life to these jewelry creations by pooling their respective talents – a complementary approach made possible by gathering more than 30 skills under a single roof. A singular wealth that the Scheufele family carefully nurtures by passing on expertise from generation to generation, along with promoting training and the in-house integration of broadly varied professions.